For this study Realytics analyzed 277 campaigns (eligible for analysis) from 123 advertisers. 42 of those have launched 84 sponsoring campaigns in 2017. The performance of these campaigns was compared to that of the 234 classic campaigns. Sponsoring generates engagement from the TV viewers on advertisers’ websites and mobile applications. The capacity of sponsoring shouldn’t be underestimated: on the base of from Realytics analyzed TV investments, sponsoring weights up 10% of the positioned TV budgets (billboard format) and recruits 14% of all direct contacts! The performance of the campaigns is measured on the base of two indicators (100 points) regrouping the whole of the classic and sponsoring campaigns. Here it is important to keep in mind that the indicator “contact/insertion” penalizes the sponsoring, since it shows some restrictions. For example, it is not possible to optimize the trailer plan for sponsoring campaigns – in contrast to the option of optimizing the media plan of classical campaigns. An average sponsoring insertion generates less web engagement than a classical spot. An advantage of sponsoring are the competitive acquisition costs, which are 37% less expensive as they are for classic TV campaigns. The main strength of sponsoring campaigns lies in the ongoing contact generation during the diffusion hours. Most sponsoring spots is placed at peak time. On the first peak tranche sponsoring recruits more contacts than classic campaigns. With 37% lower acquisition cost sponsoring offers brand the possibility to position themselves in a fitted environment at peak time. 36% of all through sponsoring generated contacts are delivered at peak time. For classic campaigns it is 24% during the same period. Important: for TV sponsoring the peak time is fixed from 20.00h to 22.59h and in the classical space from 2000 to 2199. TV sponsoring: better in combination with classic campaigns? Sponsoring can be used in combination with spots in the classic space or alone. 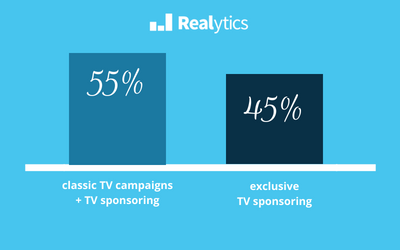 In our data the division is practically equal: 55% of all campaigns with sponsoring parts, combine sponsoring and classical TV ads and 45% are exclusively sponsoring. When mixing the two formats, advertisers spend in average 15% more budget on the sponsoring part, than for an exclusive sponsoring campaign. The number of generated contacts per insertion is 25 points higher than for sponsoring without the addition of classic spots. The price per contact lies 22 points lower. And you can measure the drive to web performance of TV sponsoring! Sponsoring on television guarantees the presence of brand at peak time in a program environment, that suits the values and the communication universe of the brand. The billboard (before and after the program and at each break) generate in average 36% of the total amount of contacts delivered by a sponsoring campaign. Sponsoring offers a brand a suited contextualization through a matching sponsoring program and leads the audience to visit the advertiser’s website or app. The sponsoring format is not to be underestimated. In combination with classic TV spots advertisers can even increase the performance of sponsoring campaigns. The classic campaign delivers the right advertising message while the sponsoring format helps with building the brand universe and its notoriety and image. Have you read our article about the drive to web performance of sponsoring campaigns?